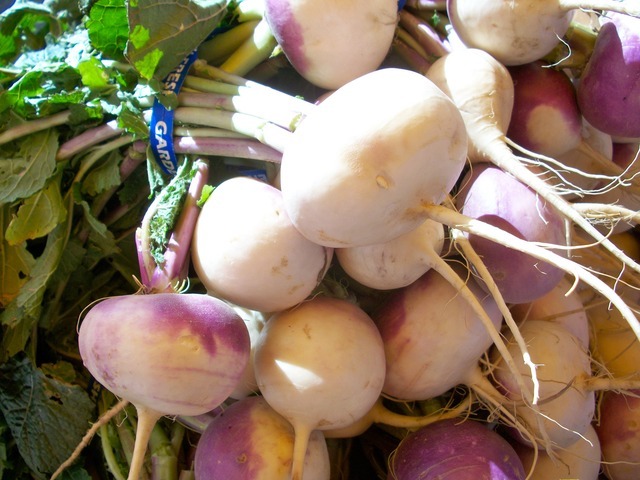 Turnip is a vegetable with lots of health benefits, and is used in various preparations. This is extensively used in cuisines like salads or soups all over the world either it is an American or European or Asian country. During fall or winter months you can get this vegetable abundantly across the stores. It can also be used as an alternative to potatoes as well due to the healthy supplements present in it. The anti-oxidants present in turnips fight against the free radicals that cause ageing of te skin and make tour skin look young, without any wrinkles, spots or fine lines. Turnips contain vitamins, minerals and beta-carotene that provide you a healthy and glowing skin. By having turnips regularly, you will have a smooth and bright skin. Vitamin A and C present in turnips help you to have healthy skin that is radiant and bright. If you have torn feet you can treat them by applying turnip externally. Take 12 turnips with leaves and boil in water. Put your feet in this water along with turnips for about 10 minutes before you go to sleep at night. After soaking your feet, rub the turnips on your feet where it is torn. Do this process regularly for 3 days and this will give you a soft feet. The torn skin of your feet will get repaired and you will have a smooth skin. Turnip leaves help in removing wrinkles from your feet. Turnips are rich in copper, which helps in the formation of melanin, which provides color to the hair. The anti-oxidants in turnips help you to have a healthy hair. Turnip greens have fibers in large quantities, which are needed for the pe=roper functioning of the digestive system. According to some researches carried on, glucosinolates present in turnips help in processing the bacteria Helicobacter pylori and other such bacteria in the stomach. Turnip is a rich source of various anti-oxidants like Vitamin A, Vitamin C, Vitamin E, manganese and beta-carotene. All these anti-oxidants are found abundantly in the leaf-greens and turnip roots are rich in Vitamin C. Turnips contain phytonutrients that enhance the activity of the anti-oxidants. So they can strongly react against the free radicals and prevent the damages caused by them like DNA degeneration of cells and so on. Bones need calcium and potassium for its healthy growth. Turnips are rich in these two minerals. By consuming turnips regularly you can protect your body from various bone related problems like osteoporosis, rheumatoid arthritis, joint damage etc. Calcium found in turnips is essential for the production of connective tissues. Turnips are low calorie vegetables, so by consuming them you can maintain your weight. They are excellent for losing weight. The fibers in turnips help in regulating metabolism and also keep a check on your body weight. They are also beneficial in having a healthy colon that functions properly. The vitamin C present in turnip makes it a powerful anti-oxidant with great anti-inflammatory properties. Therefore turnips are very beneficial in treating asthma and in reducing the symptoms of asthma. According to studies made, wheezing in patients suffering from asthma is greatly reduced by consuming turnips. Due to the presence of Vitamin K in high quantities in turnips, they have high inflammatory properties, which are very beneficial in preventing heart strokes, heart attacks and other diseases of the heart. The use of more bile by turnip greens to help in digestion results in a reduction in the level of cholesterol present in your body, as it needs cholesterol to produce excess bile. The folates present in turnips enhance the activities of the cardiovascular system. Turnips are very beneficial for those who smoke cigarettes because of the large amount of Vitamin A present in them. Smoking leads to Vitamin A deficiency and this may cause various lung problems like lung inflammation, emphysema etc. So, by consuming turnips regularly, you will have healthy lungs. Turnips are rich sources of anti-oxidants and phytochemicals which are very effective in fighting cancer. Glucosinolates are chemicals that occur naturally in turnips and they divide in to two when digested, forming two compounds called indoles and isothiocyanates. They are very beneficial in preventing cancer and also lower the effects of cancer. They aid in the processing of toxins by the liver, fights the harmful effects of the carcinogens and also controls and reduces the growth of tumor cells. So you must include turnips in your daily diet to stay away from cancer like breast cancer and from colon and rectal tumors. Eyes are one of the most essential organs in our body and its health is of utmost importance. Turnips are good for your eyes as it contains lutein in large quantities. It is a carotenoid and helps in maintaining healthy eyes and prevents many diseases of the eyes like cataracts and macular degeneration. When too much of free radicals are formed in the body, they may lead to the oxidation of bad cholesterol and the platelets to form a lump. This may cause atherosclerosis, which a condition where the blood vessels are damaged. Vitamin C, E and beta carotene present in the roots and turnip greens are rich in anti-oxidants that counteracts the harmful actions of the free radicals. So, make it a habit of having turnips in your daily diet to prevent atherosclerosis. Many people suffer from body odor, especially during the months of summer. Deodorants and perfumes can reduce it to some extent. Turnip juice is found to be very effective in getting relief from body odor. If you drink turnip juice daily, you can have a healthy body and also prevent body odor. Turnip root is greatly beneficial in the ensuring that the immune system of the body functions properly. This way your body is protected from various diseases. Turnip also contains beta-carotene, which helps in the formation of healthy membranes by the body. Some of the common ailments like loss of appetite and hemorrhoids are treated by consuming turnips. If you have kidney stones that are small in size, that may also be treated by consuming turnips regularly.